Greg Boyer’s recall is astonishing. He still remembers the exact date of his first professional gig as a part of Parliament Funkadelic —- March 9, 1978. 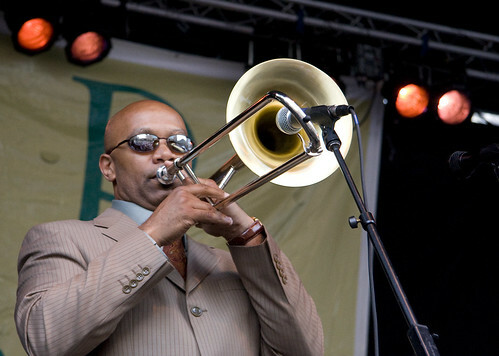 For more than three decades he’s performed with the likes of Bootsy Collins, Maceo Parker, Chuck Brown and since 2002 has been arranging horns for Prince as part of the New Power Generation band. Boyer admits he has just about everyone’s parts memorized by now. Recently he has been sitting in with Austin’s Latin funk powerhouse, Grupo Fantasma, and is looking forward to the band’s homecoming for a two-night stint (tonight and Saturday) at Antone’s. We spoke to Boyer from his home in Maryland about touring, recording a new solo album and playing with Austin’s hottest Latin export. Music Source: You’re coming to town with Grupo Fantasma as a special guest for their Antone’s dates this week. How did you get hooked up with those guys? Greg Boyer: I saw them the first time when they came through Vegas and was really impressed. Then, I saw them again at Prince’s Superbowl in ‘07 and really got an appreciation for them. When they invited me to be a guest soloist on their CD —- their Grammy nominated CD —- we just hit it off. So since then I’ve had the opportunity to sit in with them when they played with Prince at Coachella in 2008 and recently at the Black Cat in Washington, D.C. That was an unbelievable night. Are you taking on a sort of mentoring role with them? Not really. I’m more like family. Those guys are incredibly close and for them to let me in to that family speaks volumes. I wear that badge with pride. Sounds like you’re looking forward to these upcoming shows with them at Antone’s. Oh, yeah. Austin is a musician’s town, and Antone’s is the crown jewel. I really enjoy Austin. And as far as horn sections that I’ve worked with go, I can tell you those guys in Grupo have put their work in. We had three days to put all the music together for that Coachella gig with Prince, but we pulled it off —- and we had fun doing it. You’ve been arranging horns for Prince for about six years now. Any word on a ‘Lotusflow3r’ tour? Well, he isn’t using a lot of horns lately, but he keeps telling me to ‘be ready, Greg.’ So I’ve got ‘be ready’ on the brain lately. What else is on your radar these days? Lately I’ve been working with Chuck Brown up in D.C. doing jazz and big band work with him. I’ve also been working on a solo project recently, recording a bunch of everything, really. I’ve got that go-go really deep down in my system, but I’ve also got a hard-core jazz affliction. My tenure with P-Funk has given me a love of funk as well, so I’m really just trying to find some direction for this project right now. There are a lot of masters I’m trying to serve here. I’ve even thought about recording an all trombone bluegrass project. Seriously. I mean, if you really listen to bluegrass, it’s just mountain be-bop. That’s the beauty of playing jazz. You can play anything. Sounds like you’ve got a lot of influences all pulling on you at once. What about country music? I see you did a Hank Williams Jr. tribute once. That was so much fun! It was a CMT tribute to Hank Williams Jr., and they had all these guys like Brad Paisley, Kid Rock and Buddy Guy doing Hank songs, and I was asked to do the horn arrangements for about three of them. I put the music together for some of these guys, and the TV show went off without a hitch. I’ve always had a respect for country music. Rock, too. In high school I played bass in a rock band.